Albury is a city in New South Wales, Australia. It is on the Hume Highway that runs between Sydney and Melbourne. The Murray River separates Albury from Wodonga. Albury is on the north side of the Murray River. The river is also the border between Victoria and New South Wales. It is about 550 km from the state capital Sydney, but only 312 km from the Victorian capital Melbourne. Albury is believed to have been named after Aldbury in Hertfordshire. The Australian Aboriginal people called the area Bungambrewatha. There are a number of historical aboriginal sites including rock paintings. There are also scarred trees, where the bark has been removed to make shields and canoes. The rich river flats would have provided food for native animals, and the wetlands would have been home to large numbers of water birds. The first Europens to arrive in the area were the explorers, Hamilton Hume and William Hovell in 1824. They made their mark in a tree on the riverbank which later became the spot where people heading south would cross the river. Crossing the river was easy in summer when the water level was low. By 1844 a ferry was built to carry people over the river all year. There were soon many farmers moving into the area with large flocks of sheep. Some of the first in Albury were William Wyse and Charles Ebden. ↑ "2016 Census QuickStats: Albury (C)". quickstats.censusdata.abs.gov.au. ↑ Travelmate Archived 25 March 2007 at the Wayback Machine. Travelmate. Retrieved on 18 August 2011. 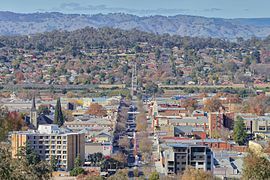 ↑ 4.0 4.1 "Albury, New South Wales". Geographical Names Register (GNR) of NSW. Geographical Names Board of New South Wales. 5 August 1994. Retrieved 1 August 2013. ↑ 5.0 5.1 5.2 5.3 "History". Welcome to Albury-Wodonga. Retrieved 2009-10-31.